G4 Weekly Market Wrap, 29th April 2011! When various methodologies provide contradictory outcomes the analyst is faced with making a judgment call on what the likely future market action will do. One of the reasons for suggesting that both markets would probably move up is that on the majority of occasions when there is a strong move up in the US market, the Australian market will tend to move in the same direction. Last week’s price action is evidence that this is not always the case. The US market performed as expected but the Australian market decided to “do its own thing”. Remember that the Australian market had a reduced trading week due to a combination of Anzac Day and the Easter holidays. The following chart shows that the two indices on this occasion went in opposite directions !!! Since the market close last Thursday, the S&P500 has risen 2.1% whereas the XJO has dropped 1.8%. In the same period, the AUD has gone up 2.1% against the USD so we can clearly see where some of the differences came from. The problems associated with comparing assets with different exchange rate bases causes significant distortions in observations. This morning Barry (our G4 Fibonacci guru) sent me the following article featured in the Daily Reckoning recently. “But we poor Aussies are missing out on much of the recent fun. Metal prices in Australian dollar terms aren’t matching the American’s parabolic rise. Even the stock market is giving up the US’s strong leads to a jumping Aussie dollar. Each time you think the ASX200 will go up, the AUD rises instead. On the bright side, if the Aussie crashes, all our assets will go up, right? When the US dollar falls, as it has been doing, American assets tend to go up in dollar terms. Money is worth less, so prices rise. Simple. And win/win. Either the US dollar is the stellar performer or the Dow Jones is rallying. The over-optimistic American media loves it. But for an ASX-listed stock, life is different. Each time Wall Street seems to signal a great day, the Aussie dollar eats into the gains. That’s because, of late, the Wall Street rallies have been predominantly US dollar falls in disguise. And the Aussie dollar’s rise is the giveaway. Any real stock market rally would hold water against currencies around the world. The US market’s gains don’t. So the ASX stays put. Were the Aussie dollar to fall, that would indicate a flight away from risky assets, causing the ASX 200 to fall. The following chart clearly shows the effect that the falling US dollar has had on the S&P500 index. As I am expecting that the global indices will enter into a bear market phase in the near future I thought that it was worthwhile looking at one of the aspects that could cause this change in market sentiment in the future. Bernanke’s press interview recently was interesting in that he is still claiming that QE2 will end in June. Strange that this coincides with G4’s anticipated market top month. In the meantime one of the factors causing inflation fears in the US is the rising oil price. I thought that the following Chart of the Day articles was relevant to this discussion. There is no doubt that the next few months will be very interesting to observe and with dangers lurking underneath the gloss of a rising US market I would suggest that very tight stop-loss settings should be the order of the day. In last week’s market wrap I suggested that the S&P500 may have completed a Minute wave 2 and would commence Minute wave 3 in the coming week. When we drill down into a potential Minute wave 3 we would anticipate a 5 wave move comprising of Minuette waves 12345. I suspect that we are in the midst of Minuette wave 1 and that this wave may have completed in the last trading session. In the following chart I have put a ? market after the Minuette wave 1 label to suggest that this may be the top of this particular pattern. Should Minuette wave 1 continue then the next Fibonacci level would be the 88.6% level at 1374.8. 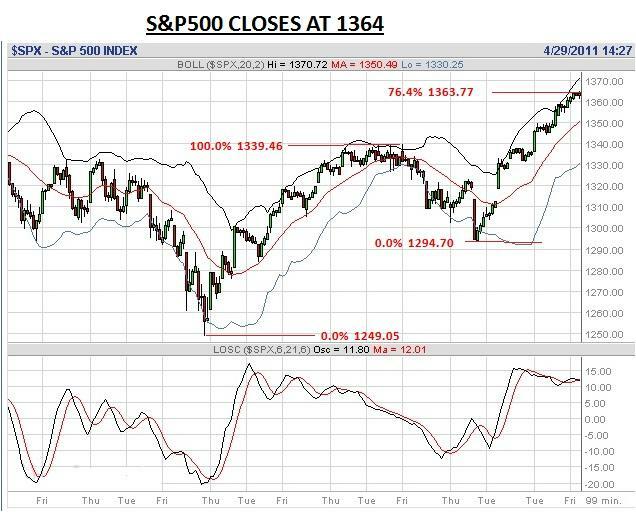 The reason for believing that we may turn at the current level is because the S&P500’s close at 1364 in its last trading session is at the 76.4% Fibonacci level (1363.77) and the 1364 Saturn line discussed in last weekend’s Market Wrap document. Note also that the daily chart price action is currently fractionally above the Upper Bollinger Band. The following 99 minute intraday chart shows that the price action is currently at the 76.4% Fibonacci level. It also shows that the price action has trended up whereas the LOI trended slightly downwards thus suggesting a short term divergence. We can see from the weekly planetary chart below that the Saturn line that was at 1364 last week has edged up to 1365 this week. As Saturn lines can often act as both support and resistance the current level could quite possibly be a good place to form a top. However should there still be some upside to the price action then the Neptune line at 1379 would become the next logical target. Note that the Neptune line is close to the 88.6% Fibonacci level at 1374.8. The strong lead from Wall Street currently has the ASX200 futures suggesting a positive market open on Monday of 32 points. The ADRs on the NYSE had BHP up 0.30% RIO up 0.62% and WBC down 0.84%. They are not very encouraging but it should be remembered that on the US market open these stocks would have been strongly negative following the previous Australian trading session’s market action. Australian investors will no doubt be mindful of the number of positive market opens that occurred last week that eventually flopped during the day. I suggest that this will probably continue into the next week. Looking at the following Conti chart for the XJO, there is a strong possibility that the current price action will continue to head south until late next week. If the Conti chart is correct then the 33 trading day cycle should put a bottom in place on the 6th May +/- 3 days. That would suggest that any move up in the market on Monday morning could quite possibly be a counter trend to the current retracement. The following 30 minute intraday chart of the XJO shows us that the LOI has turned up just confirming the possibility of an upward move. It should be noted that the MBB at 4848 has acted as overhead resistance during both declines shown on the chart so in order for any rebound to be of any consequence, this barrier must be overcome. The following 99 minute intraday chart shows the bounce off the LBB and the W%R10 indicator also shows a bounce in the making. It should be noted that the LOI is continuing on a downward trend (sell signal) and is currently showing no signs of changing trend. The following daily chart of the XJO also shows that a bounce occurred off the LBB but once again the LOI is still on a sell signal. The Bollinger Bands are contracting thus signaling that another relatively significant move is building. The LBB’s on the 99 minute and daily charts are providing support at 4798.5 and 4796.0 respectively. Whilst some of the signals in the above charts indicate that a bottom may be in, the sell on the LOI signals and the Conti chart suggests that a bottom is still a few days off. This also coincides with some of my other cycles analysis methodologies so obviously caution is necessary in the coming days as a lot of damage can be done in a few days. The following weekly planetary chart shows the XJO stuck between the Saturn line at 4919 and the Neptune line at 4794. It really has been caught in between these to planetary lines for the last 4 trading weeks. If the Conti chart is correct and there is further downward movement on the cards then the obvious support is the Neptune line at 4794. If that fails then the next support doesn’t come in until the Saturn line at 4681. In spite of contradictory outcomes being suggested by the various methodologies my leaning for the US market is that a top may have been put in place in the last trading session and hence a decline may commence if not in the next trading session then certainly early next week. Wave 2’s can often retrace most of wave 1’s ranges however initial targets of around 1329 (50% retrace) or 1321 (61.8% retrace) would appear to be sensible for a starter. As for the Australian market I remain to be convinced that Monday’s opening bounce will be anything more than a counter trend to the existing downward move. Until those LOI indicators in the 99 minute and daily charts are turned around, the trend should remain down.